4 stars of dark and intriguing anime. 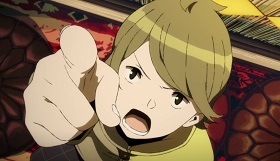 Occultic;Nine is based on the Japanese light novel of the same name written by Chiyomaru Shikura (Steins;Gate). 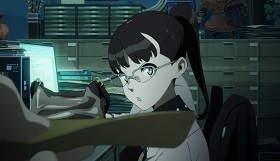 It is adapted to anime by A-1 Pictures (Magi: The Labyrinth of Magic, Your Lie In April) and directed by Kyohei Ishiguro. Volume 1 comprises episodes 1 – 6. The story revolves around school boy Yuta Gamon (Erik Kimerer – Nura: Rise of the Yokai Clan) who runs an affiliate blog named Kirikiri Basara, which compiles stories on the occult. His goal is to use the page for advertising income. Assisting him in this is the magnificently well endowed and very enthusiastic Ryoka Narusawa (Faye Mata – Fate/Apocrypha), who is very fond of zapping him with her taser gun. In addition to the Kirikiri Basara team, there are seven other individuals, each with their own quirks and deep dark secrets, seemingly unconnected. 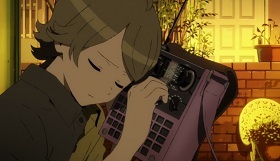 We have fortune teller Miyu (Kaylii Mills), Sarai (Robbie Daymond – Charlotte), the son of a murdered Professor and Touko (Erica Lindbeck – Coppelion), a news reporter for a local paper. Also in the mix are police officer Shun (Max Mittelman – Erased) and manga artist Ririka (Michelle Ruff – Bleach, Durarara!!x2). Last but by no means least we have black magic practitioner Aria (Cristina Vee – Blade of the Immortal) and her mysterious ghostly friend Kiryu (Greg Chun – Fallout 4). When Yuta stumbles onto a crime scene, he unwittingly starts a chain of events which will bring them all together in unimaginable ways. 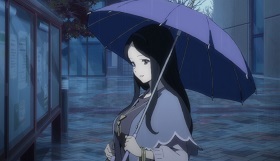 Dark, brooding and full of surprises from start to finish, this is a fascinating anime. The animation suits the story very well, piling on the atmosphere with brilliant use of light and shade. A great story with one heck of a cliffhanger. Well worth adding to your collection and I can’t wait for volume 2. 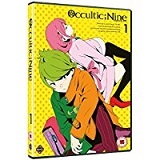 Occultic Nine Volume 1 is available to buy now on DVD and Blu-ray.